As I've rambled on in previous posts, I have loads of soup recipes. Many that I've clipped over the years have become favorites, yet there are scores upon scores that still remain untried. Every so often, I'll take a peek at this growing file and add or eliminate a recipe but the process has been a slow one. Recently, a friend dropped by with what amounted to a small arsenal of Pacific Foods broths. I stacked them, by type, along one shelf in our garage and now refer to this section as our "soup aisle." Given this generous offering, I thought it would be great to expand beyond Pacific Foods' tried-and-true organic, low sodium, chicken broth, which I regularly use, and opted to make a veggie-based soup. This particular recipe is very much a "tomato soup" with a south-of-the-border kick. Apart from its great flavor, it's just so easy and quick to prepare. I'm not sure why I haven't made it prior to this but it's definitely going into my "keeper" file. The base of this soup is made with vegetable stock, tomatoes, onion, garlic, chili powder, and a few seasonings. It comes together quickly and needs only to simmer for about 20 minutes to meld these flavors and thicken a bit. 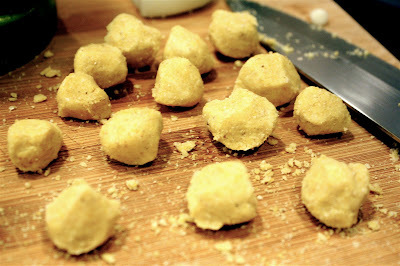 To this, you add garbanzo beans...and then these mini cornmeal dumplings. Similar to a tortilla soup, perhaps, you get a touch of that corn-based flavoring from these dumplings. At first I thought the recipe must be incorrect in that you make such a small amount of dough and the "balls" are just so tiny. However, it works. While you may also have to add additional water to get the consistency of the dough correct, you end up with these great, mini-sized balls of cornmeal that pair beautifully with the tomato-veggie broth. And there's just enough kick in the broth to keep it interesting. If you wanted more, you could certainly add some diced jalapeño to the mix. At the end, you incorporate a bit of freshly squeezed lime, and then plate up the soup topped with a sprinkle of chopped cilantro and feta cheese. It's light and fresh, yet satisfying. It's a great option for a Mexican-style soup that's veggie-based. 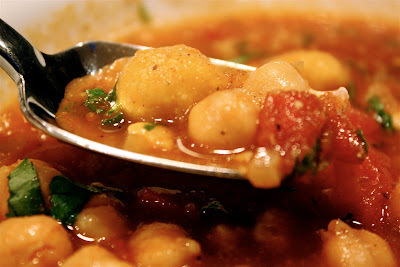 While we made a meal of this little soup, I think is would also make a great starter soup. I would follow it up with a fresh orange and beet salad, topped with feta and cilantro (mimicking some of the same flavors of the soup), and then, perhaps, a squash-cheese enchilada entrée...keeping the entire meal veggie-based and fresh. 1. Heat 3 teaspoons olive oil in a Dutch oven or large stock pot over medium-high heat. Add onion, sauté 3 minutes or until tender. Add chili powder and garlic, sauté 30 seconds. Add broth and next 6 ingredients (through tomatoes). Bring soup to a boil and then reduce heat and simmer, covered, for approximately 20 minutes. 2. While the soup simmers, combine cornmeal and salt in a small bowl. Add 3 tablespoons hot water and olive oil. Mix until dough holds together. (note: the dough will be dry but it should retain enough moisture to allow you to form it into tiny balls about 2 to 3 times the size of a garbanzo bean). Once you've achieved the right consistency (careful not to add too much water), divide the dough into 16 to 24 small balls (dumplings). Add dumplings to soup and completely submerge them into broth. Cook soup uncovered for approximately 5 to 7 additional minutes to allow dumplings to cook through. Add lime juice and 2 tablespoons of chopped cilantro. 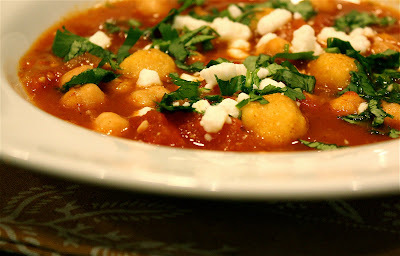 Ladle 1 cup of soup into each bowl, sprinkle with feta cheese and additional cilantro (if desired).